FRANKFURT - Damages from Hurricane Harvey’s ravaging of Houston and the Texas Gulf Coast are estimated to be well below those from the major storms that hit New Orleans and New York in recent years, insurance executives have said. The early assessment of damage from Harvey, made while rain continued to pelt the fourth-largest city in the United States, came as a scientist from the world’s largest reinsurer predicted that climate change is likely to result in more intense storms in the future. “There are more thunder storms in parts of Europe and the United States than in past decades,” said Ernst Rauch, head of Munich Re’s Corporate Climate Centre, which monitors climate change risks. Harvey, which has been downgraded to a tropical storm since making landfall, has struck only days before senior insurance executives meet in Monte Carlo to haggle over reinsurance renewals against the backdrop of insurance sector complaints that premiums are too low. German-based Munich Re and Hannover Re, two of the world’s largest reinsurers, said current information suggests that insured losses from Harvey are likely to fall well short of the $75 billion for Katrina in 2005 and $30 billion for Sandy in 2012. Air Worldwide, a provider of catastrophe risk modeling software and consulting services, said early on Monday that insured losses from Harvey’s wind and storm surge were estimated at between $1.2 billon and $2.3 billion. That figure does not include flooding. The relatively low damage estimates will be of little comfort to citizens whose homes are under water or whose safety is still threatened. Houston is facing worsening flooding in the coming days as the storm dumps more rain on the city, swelling rivers to record levels and forcing federal engineers on Monday to release water from reservoirs in an effort to control the rushing currents. 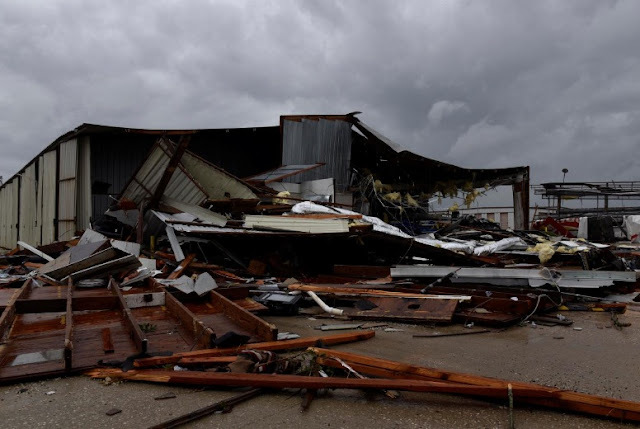 “There are so many areas that have been hit by devastating winds and now the massive flooding, and insurance adjusters are having to wait for first responders to simply check on the safety and welfare of citizens,” said Mark Hanna of the Insurance Council of Texas. Claims, however, are expected to accelerate. Reinsurance stocks suffered on Monday, with shares in Hannover Re down 1.3 percent and Munich Re off 0.9 percent while French reinsurer Scor dropped by 1.5 percent. Shares of U.S. insurer Allstate lost 1.3 percent while Travelers Companies lost 2.7 percent, with the S&P 500 property and casualty insurance index down 1.8 percent and on track for its worst day since last October.